US Powerball is one of the world’s most popular lotteries, and for good reason. It’s known as a rollover lottery, which means that if no one wins the previous jackpot, it will simply rollover into the next one. In other words, the longer no one wins the jackpot, the higher it will get in succeeding draws. It’s one of the most lucrative lotteries around because of this. Itching to play US Powerball yet? Read on to find out more about it! US Powerball was first known as Lotto America back in 1988. On April 19, 1922, it switched to its current name. Three days later, it would hold its first drawing. Likewise, the US Powerball format underwent two changes — first in 2012, and then later in 2015 – to arrive at its current form. The non-profit Multi-State Lottery Association (or MUSL, for short) owns and operates US Powerball. This means that over 40+ member states run the games, with each one keeping the profits from tickets bought in their particular state. This also means that taxes on lottery wins will differ from state to state. Large Prizes: US Powerball is known to be one of the most lucrative lotteries in the industry. Jackpots start from $40,000,000 and have gone as high as $1.58 billion. Fixed Prizes: While jackpots are shared between those who have a winning ticket, other prizes are of a fixed amount. 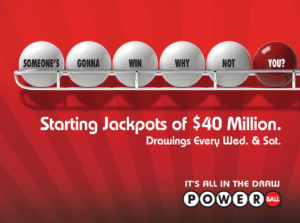 Bi-Weekly Draws: US Powerball has bi-weekly draws – in other words, more chances of winning. Reputable: US Powerball has been around for 25 years now, and has been consistently paying winners since. Differing Taxes: As with most lotteries, the taxes involved in US Powerball differs from state to state. Meanwhile, if you win from overseas, a flat 30% tax will be withheld above the state tax. How Does US Powerball Work? Take note that the red ball can be the same number as one of the white balls. You can pick numbers manually or via a Quick Pick option – which means you let a system randomly pick the numbers for you. Winning numbers are drawn at 10:59pm every Wednesday and Saturday at Universal Studios in Florida. Two drums, one containing the white balls, and the other containing the red balls, are used to randomly select the winning numbers. Matching all 6 numbers awards you the jackpot, while matching 5 gives you the 2nd place prize category, and so on. Each ticket line costs $1, but some online lottery sites may charge higher to cover for the service of purchasing, scanning and safekeeping tickets. You can also include a Power Play number in your entry. For an additional $1 on top of the $1 per line (again, prices may vary on lottery sites), the Power Play number multiplies prizes for non-jackpot winnings by up to 5 or 10 times. The second prize with the Power Play multiplier activated, for instance, is automatically doubled to $2,000,000. Check out the table below to see how Power Play affects each prize category. Winning the Powerball isn’t easy, especially when it comes to the jackpot. Check out the table below for a quick reference. Powerball jackpots are split between anyone who has a winning lottery ticket, while all other prizes are of a fixed amount. That said, non-jackpot prizes could be reduced if the number of winners exceed the lottery operator’s prize fund. Winners have the option to choose whether to collect their payment as an annuity paid over a 29-year period, or as a lump sum. Winners have a year to claim their prize. Otherwise, the money often goes to the National Lottery Distribution Trust Fund, which funnels the money to charity. This won’t always be the case, though, as each MUSL member has different rules that dictate what happens to unclaimed prizes. One of the best things about the US Powerball is that if a jackpot isn’t won, it’s carried over to the next one and – get this – accumulates until someone wins. Theoretically, if no one wins the jackpot in several consecutive drawings, the resulting prize could be astronomical! $1.58B – On January 13, 2016, lotto fans everywhere witnessed a historic moment when 3 tickets won the biggest Powerball jackpot. Two couples – John and Lisa Robinson, and Mae and Marvin Acosta – plus a 70-year old woman named Maureen Smith, each won a share in the $1.58 billion jackpot. All three ticket holders chose to take home a lump sum payment of $327.8 million each (before taxes). $768.4M – The March 27, 2019 draw marks the most recent and second-largest Powerball jackpot ever reached. So far, one winning ticket has been confirmed. The winner has not yet come forward to claim their multi-million dollar prize, which they can take home in full over 29 years, or as a single lump sum of $477 million. $758.7M – Last August 27, 2017 was probably the biggest day of Massachusetts woman Mavis Wanczyk – the sole winner of the third-largest Powerball jackpot ever. She took home about $336 million after everything was said and done. $590.5M – The winner of the May 18, 2013 Powerball drawing was 84-year old Gloria McKenzie of Zephyrhills, Florida. Without having anyone to share the winnings with, she took home a whopping $278 million after taxes. On March 31, 2005, 110 people all won a Powerball drawing. Some won $100,000, while others who played multipliers won $500,000. Seeing as all of them chose the numbers 22, 28, 32, 33 and 3, the lottery operator immediately thought that they had been cheated. The odds of 110 people choosing the same exact numbers are astronomically high, after all. After an investigation, it was revealed that all 110 were legitimate winners. Here’s the crazy part: they got the winning numbers from a fortune cookie. The biggest Powerball jackpot ($1.58 billion) became that large because 19 consecutive drawings never produced a winner. You must be at least 18 to play Powerball in Michigan, but in Nebraska, you must be at least 19. Meanwhile, you must be 21 or older to play Powerball if you live in Arizona, Iowa or Louisiana. Powerball operators store the numbered balls inside a double-locked vault – one that needs three people to open. Talk about tight security! This one isn’t “fun,” but it’s interesting: A group of restaurant employees were in a state of revelry immediately after hearing that they had won the $900 million Powerball jackpot in January of 2016. They were absolutely ecstatic – for about 20 minutes. It turned out that the numbers they matched were actually for an earlier drawing. Ouch! The Bottom Line – Should You Play US Powerball? You Could Be The Next Powerball Winner! Winning in Powerball is not easy – but what lottery is? The great thing about the US Powerball is that, if you win, you win big. More so if you shell out extra for the Power Play. Even if you don’t win the jackpot, the fixed prize amounts for other categories ensure that you don’t have to split the winnings with other players. So, is US Powerball worth it? Absolutely. There’s a reason it’s one of the world’s most popular and lucrative lotteries. I tried to play lottery games via euro-million and my payment was declined because of capital controls. I used credit card in order to pay. I would like to ask if there is another solution for playing lottery jackpots? Will i play via paypal method? I’m assuming you’re from Greece? You probably know this already, but in case you don’t, there’s been some confusion among Greek banks regarding capital controls. Banks are interpreting it in very, very different ways. Some are allowing international transactions, while some are outright denying any transactions abroad. To answer your question: although Greece has recently relaxed capital controls, it looks like PayPal accounts are still blocked. You could try other online wallets, but that might prove futile. Unless, of course, the Greek government completely removes all restrictions on international transactions.